Not very far from Karnataka’s Cultural Capital, Mysore in India is a small village named Somanathapura on the banks of River Cauvery. The village is known for its Keshava temple, one of the most magnificent temples built in the style of Hoysala Architecture. I fell in love with Somanathapura the moment I entered the village. White row-houses with roofs of red tiles lined both sides of the paved streets. The coconut palms which towered over the streets along with the occasional green and blue homes added a unique charm to the neighborhood. To appreciate the town-plan of Somanathapura, I would suggest taking a look at its aerial view on google maps. 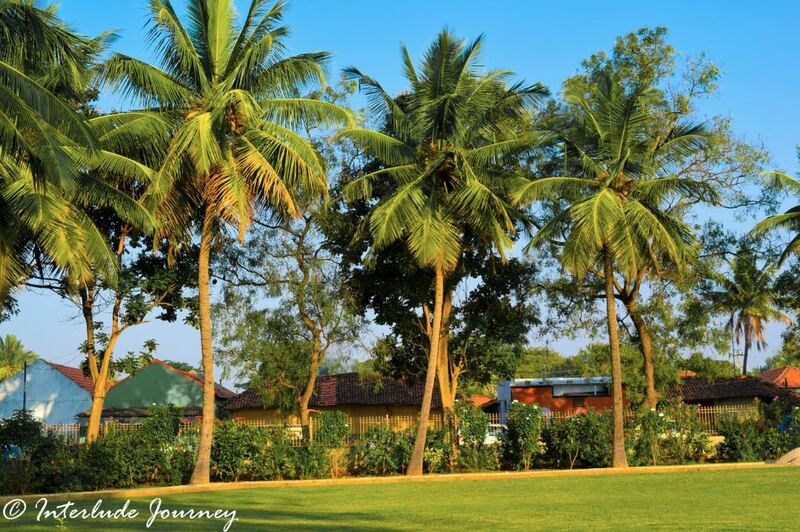 The stone structure of the Keshava temple and the well-manicured lawn occupied the center of the village while being surrounded by coconut grooves on one side and the village homes on the remaining sides. The coconut palms which towered over the streets along with the occasional green and blue homes added a unique charm to the neighborhood. To appreciate the town-plan of Somanathapura, I would suggest taking a look at its aerial view on google maps. Going by the name of the village, I assumed that the temple complex at Somanathapura would be dedicated to Lord Shiva (Somnath is one of the names given to Lord Shiva). However, when I learned that the chief deity of the temple in Somanathapura is Keshava ( also called Vishnu or Krishna), I was curious to know how the town got the name Somanathapura. 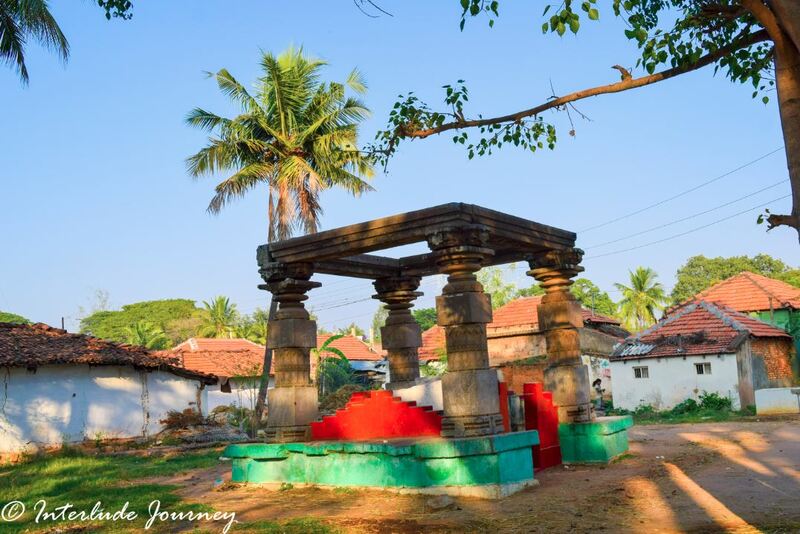 I was told that the village and the temple get their name after the Hoysala Commander named Somdandanayaka who constructed the temple during 1268 AD under the reign of King Narasimha III of Hoysala Dynasty. It is believed that Somanathapura is the last of the ornate settlements of Hoysalas. A huge Manosthambha ( a stone pillar) erected outside the main temple complex caught my attention as I walked into the compound. The temple looked crowded with visitors because it was a weekend. A few families were taking respite from the heat in the shade of a huge tree present in front of the temple. The main temple was enclosed by a walled courtyard and had a gate and a Porch. From the lawn outside the temple, I could see three spires raising from beneath the courtyard wall as if keeping a watching over the village. The main door of the temple was decorated with brass spikes. Such designs on the doors were used in olden days to stop the elephants from breaking the doors during an attack. However, the brass spikes made on the current day door are more intended to be ornaments on the door. To the left of the porch was a huge inscription written in Halegannada (old Kannada script) which had details of the temple construction. Though I have studied Kannada, it was tough for me to decode the inscription because there is a lot of difference between the current day Kannada language and Halegannada. I could see that the main temple which stood on a star-shaped stone pedestal at the center was thronged with a group of local tourists. To beat the crowd, I chose to go around the corridor of the temple courtyard. The courtyard was lined with many smaller shrines which had no idols.The idols were probably removed or vandalized during the many invasions that happened on the temple. Going around the courtyard, I could get a complete view of the spires and the outer walls of the main temple. 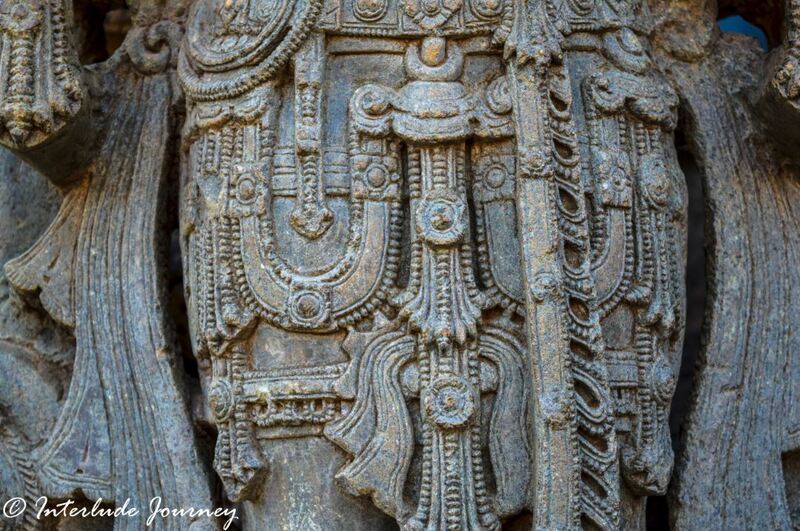 I couldn’t help but be amazed by the intricate carvings on the temple walls. Every corner and angular projection of the temple wall had beautiful carvings of familiar deities appearing in all their glory adorned with ornate jewelry, towering crowns, garlands, and anklets. 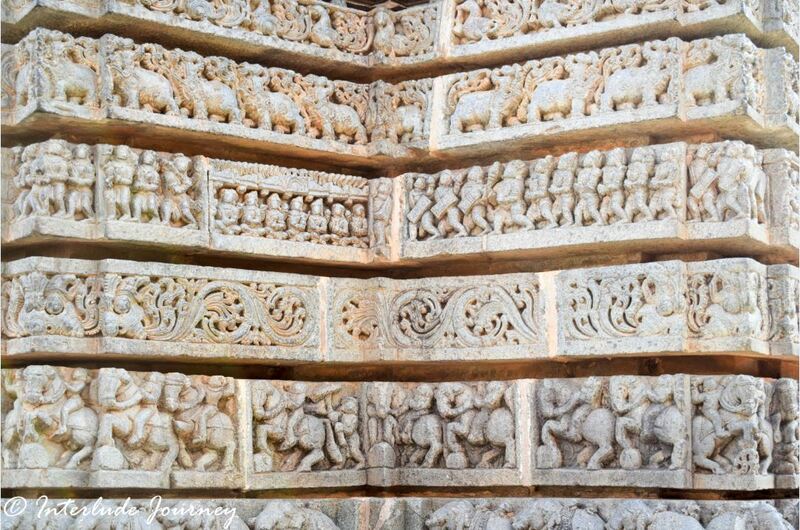 The bottom portion of the walls had many rows of intricate carvings of elephants, horses, dancers, musicians, and various scenes depicting the stories from Indian mythology. Most of the carvings seemed to be in good shape but on a closer inspection, I could notice that they were damaged in many places. While some elephants had lost their trunks, there were no arms on some of the deities. Since it was midday and the sun was quite harsh, I quickly finished going around the courtyard and made my way towards the entrance of the main temple. Two idols of dwarapalakas stood guard to the main entrance of the temple. Like the fate of many carvings, the dwarapalakas too had no arms. They were probably destroyed during the onslaught of medieval and modern vandalism. Once inside the temple, I could see three shrines dedicated to the three deities Keshava, Janardhana and Venugopala, all three being different forms of Lord Vishnu. Unfortunately, the beautiful idols were no longer worshipped because they were damaged. The most interesting part about the Keshava temple of Somnathapura were the beautiful carvings made on the temple ceiling. 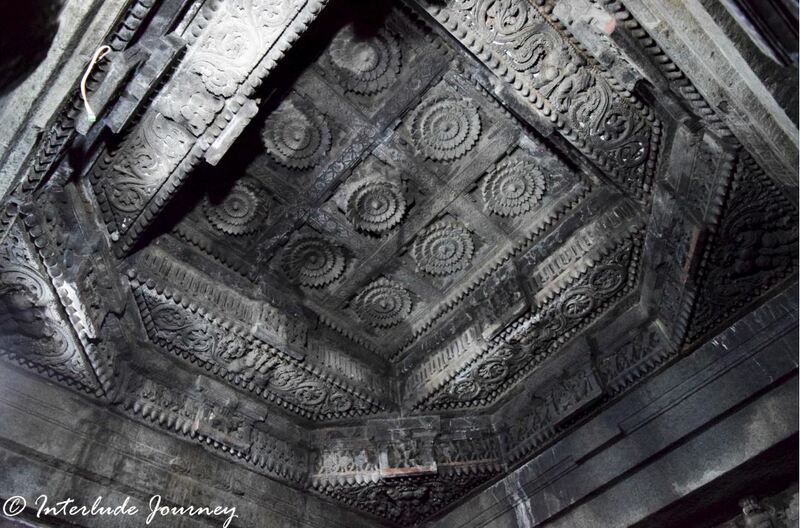 There were about 16 complex and unique carvings made on the ceiling some of which resembled lotus petals, banana bud, stepped pond and entwined knots. Though it was quite dark inside the temple, I could manage to take pictures of a few carvings on the ceiling. I shall let the pictures do the speaking from here. Like all Hoysala temples ( especially the ones in Belur and Halebidu), the Keshava temple at Somanathapura is a visual treat. It is said that even the great Cholas could not get their artists to produce works with the same effervescence. 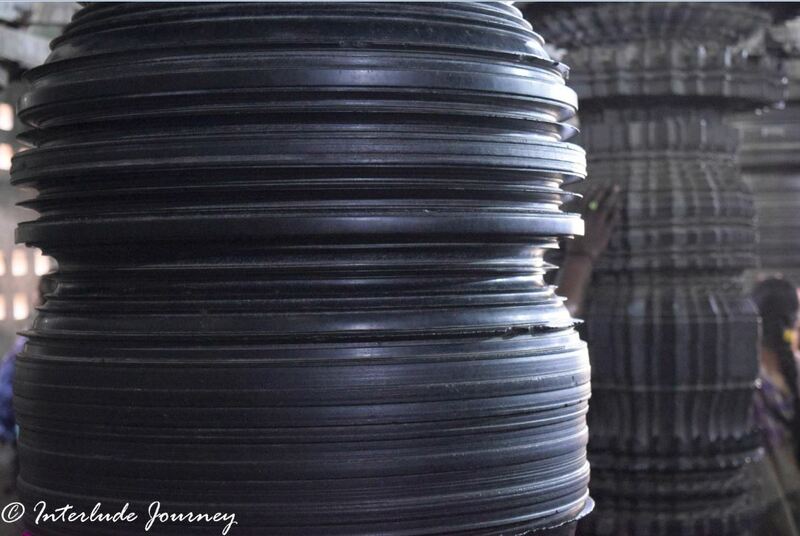 So, when you are in Bangalore or Mysore, make some time to pay a visit to this artistic marvel. Somanathpura is at a distance of 30 Kms from Mysore and about 140Km from Bangalore. Nearest Airport is at Mysore and the nearest railway station is at Mysore or Mandya. Entry tickets are priced at INR.5 for Indian nationals and INR.100 for foreign nationals. – Somnathapura is a very small town with no facilities for accommodation. You can stay in Mysore, Maddur or Bangalore and plan a day trip. – There are no hotels in the village except for a few petty stalls which sell tea and some snacks. It is better to carry packed food and water. – Since the temple is fully made of stone, it gets very hot during midday. It is good to plan your visit during the morning or evening times when the sun is not very harsh. – Guides are available for your assistance in case you wish to know more about the temple and Hoysala architecture. – Visitors are not allowed to wear footwear inside the temple courtyard. Consider carrying a few pairs of socks if you are uncomfortable walking barefoot. – Clean washrooms are available behind the temple. 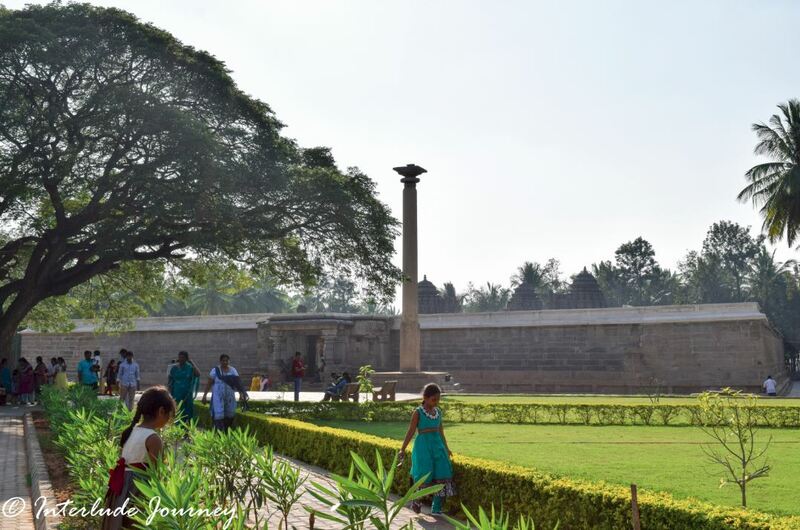 – Other interesting places to visit near Somanathapura are Talakadu, Shivanasamudra, Melukote, Mutatti, Srirangapattana, Ranganathittu and Mysore. – If you are interested to know more about the Hoysala architecture, plan a visit to Halebidu and Belur located around 220 Km from Bangalore. What wonderful photos! Thanks so much for this great post about the Somanathapura region of India. Very nice post and superbly captured pics. There is something about ancient temples of India which hypnotise me. I didn’t even know about this temple in Somanathapura. The architecture is brilliant and quite similar to other temples of South India. wow, India has such incredible detail in everything it does. I NEEEEED to go pronto! thank you for this beautiful post! Very nicely articulated, thumbs up from my side !! Excellent photographs and write up,I have been to the place and was completely bowled over by the crafmanship of the temple.. This is a gorgeous one – a typical Hoysala dynasty temple but as beautiful as always. Each corner seems to have a story and your pictures say them all. Well done with those, especially the ceiling ones which are the hardest to take. 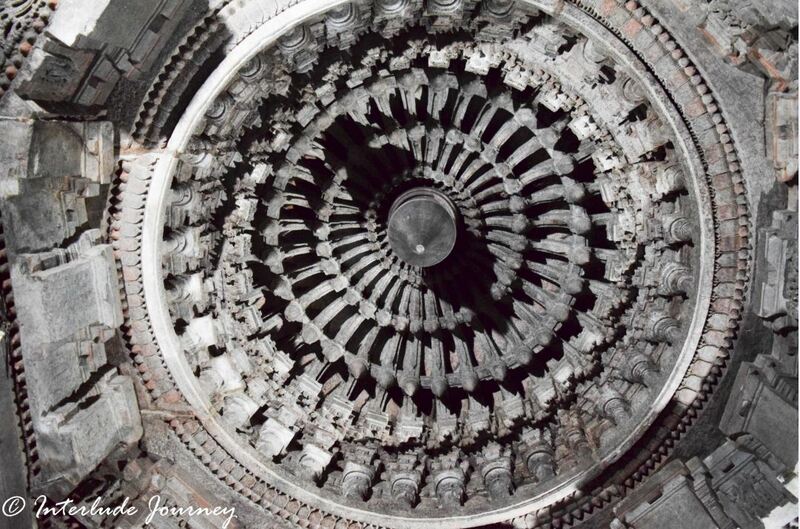 I have visited this long back but hope to do a new one …and soon! 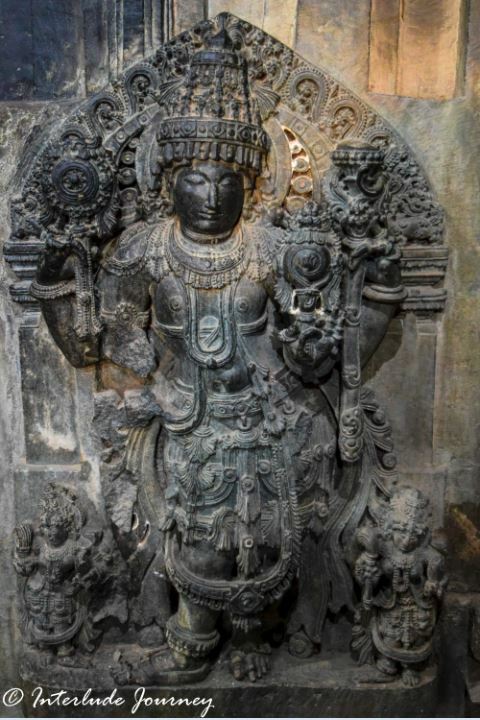 The Somanathapura temple is a stunning testimony of the craftsmanship of the Hoysala dynasty. To think that it is so close to Bangalore and till recent times we had not seen it, proves the fact that many a time we tend to ignore the tresasures of our own backyard as we set our sights on far away shores. These images are a visual treat of the Hoysala temple. Your tips are quite helpful too. Beautiful photos! That architecture is amazing. You did a great job capturing the beauty of this temple. Such a mesmerizing architecture! Lovely photos and place. I really want to leave everything behind and do a road trip to an amazing place like this! Looking forward to reading such amazing blogs in the future. The sculptures are so awe-inspiring. I find a similarity of these sculptures with the ones I saw in Ellora. 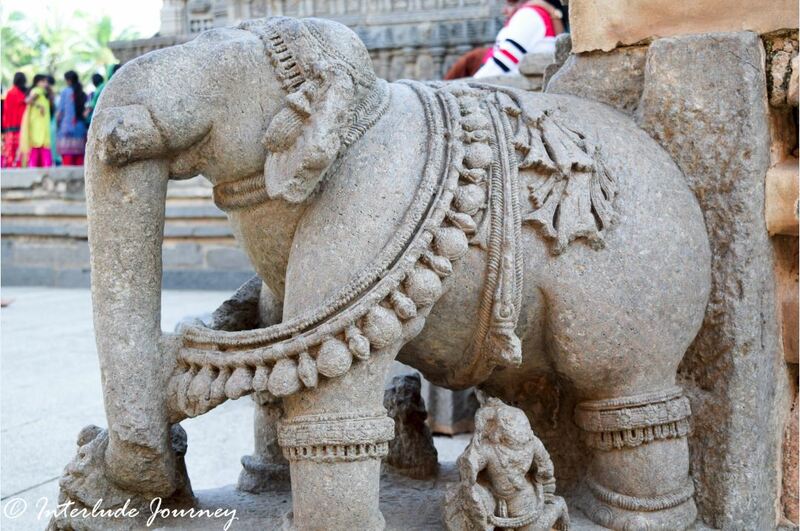 For example, the dwarapalakas and the elephant were abundantly available in the Ellora cave temples too. Thank you for adding the minute details and tips. I would definitely like to visit this temple. 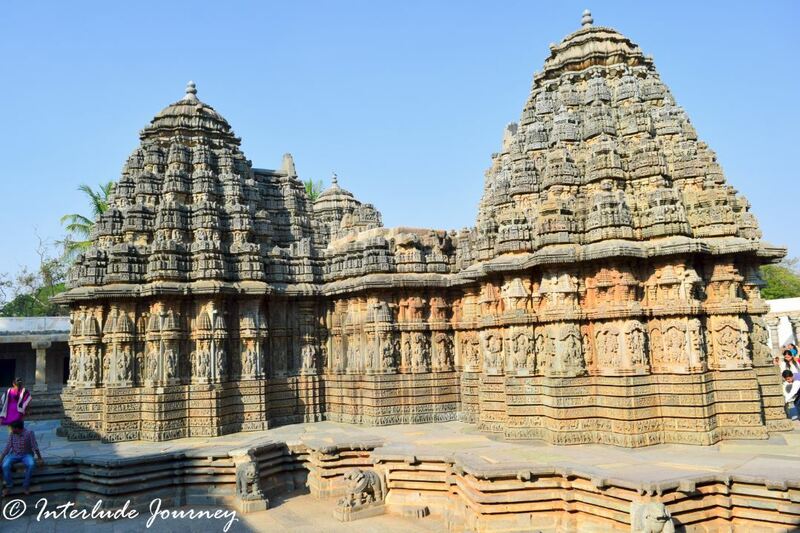 The information given here about keshava temple somanathapura is worth reading and the images shown here are mind blowing.After reading the blog I feel that I must visit this place once in my life to make my life memorable. Thank you for posting such beautiful information. Thankyou Manish. Hope you get a chance to visit soon.